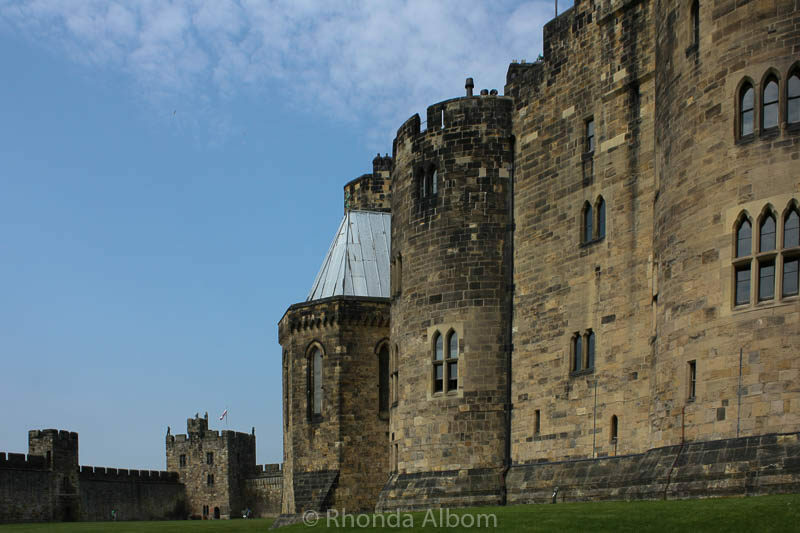 We each stepped inside Alnwick Castle for different reasons. For hubby and I, it was part of the journey through time in the British countryside. Downton Abbey fans find it a familiar Christmas backdrop. And, for our girls and other Harry Potter fans around the world, it’s Hogwarts. No, this is not a Warner Bros studio, it’s a real working castle and home to the Duke and Duchess of Northumberland and their family. We took the tour included in our entrance fee. Interestingly, our guide was in high school when they filmed scenes from Harry Potter here. Many of her friends are in the movie, but she wasn’t selected. She was still quite bitter, making the day even more memorable. 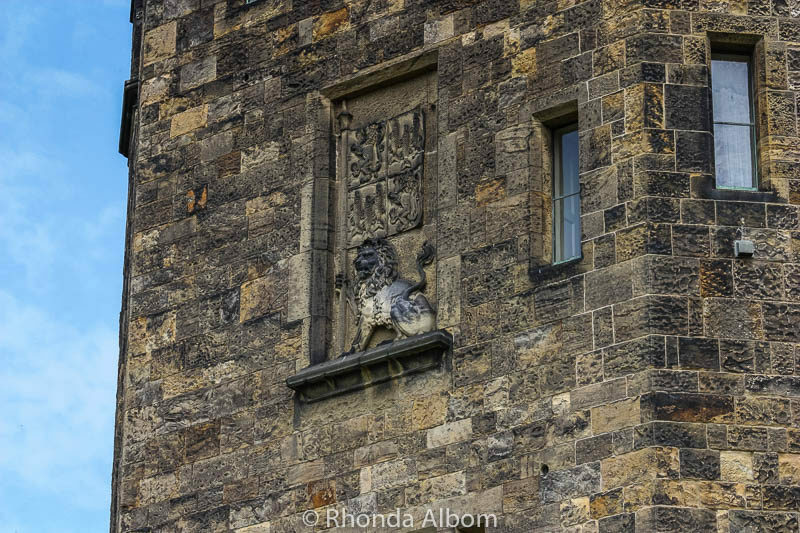 On top of the towers and many of the walls stand a variety of unusual figures. I couldn’t resist a bit of Lightroom editing on this one. What do you think of the outcome? 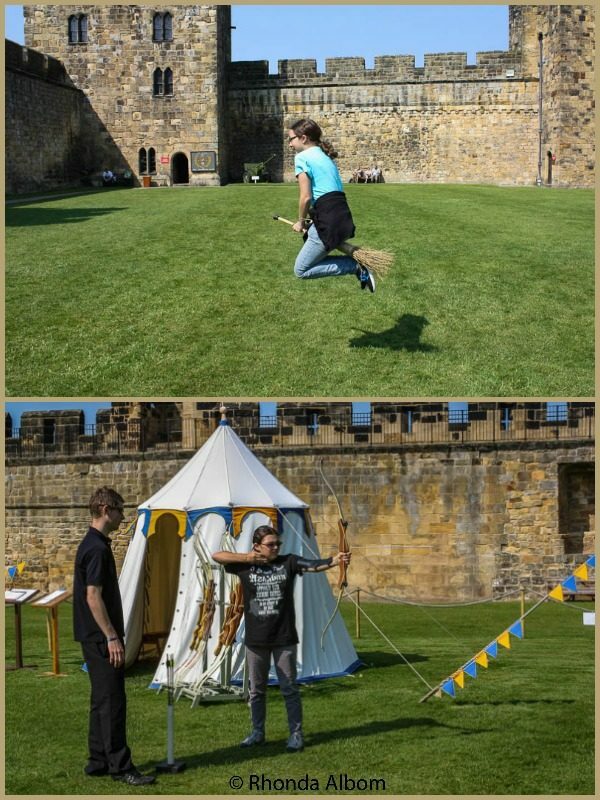 Yes, our girls did learn to fly a broomstick in the same field as Harry Potter (it’s also where he learned to play Quidditch.). They also had archery available to try. I did share my photo secret for the flying shot. However, lucky timing caught the arrow mid-flight. 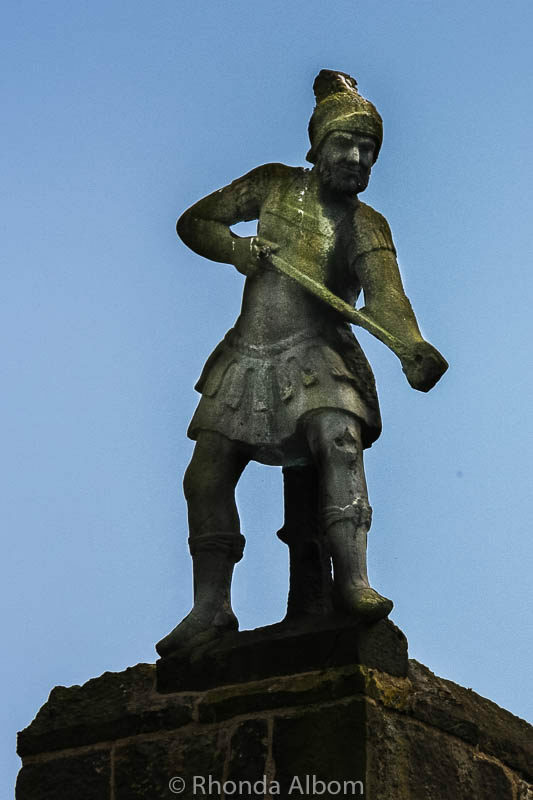 A closer look at one of the figures on top of a tower. 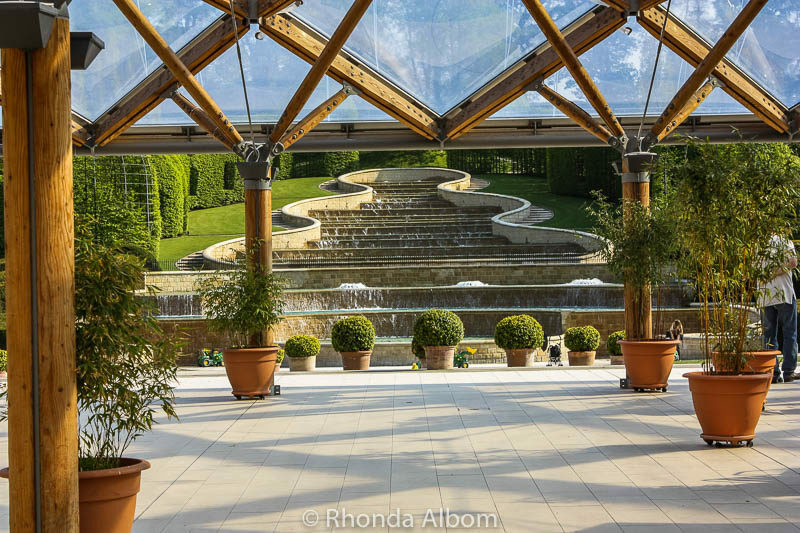 The gardens at Alnwick are also quite famous but have a separate fee. As I lingered earlier in the day at Rievaulx Abbey, we had limited time and had to choose between the gardens and broomstick flying. Clearly, with our girls, it was broomstick flying. And, several TV shows since 1983. Alnwick Castle was built in the 11th century. The castle is open to visitors from March to October, with varying hours. See the official web page for details and a discount on tickets if you purchase at least 24 hours in advance. 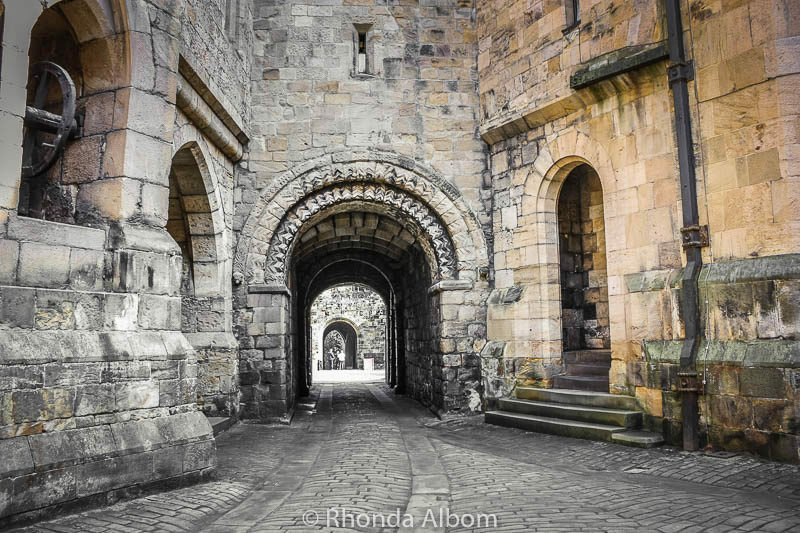 One of the more popular British castles, Alnwick gets nearly 250,000 visitors annually. We stayed at a Premier Inn at just about every UK overnight stop. They are clean, comfortable and affordable. We always check prices at Booking.com. 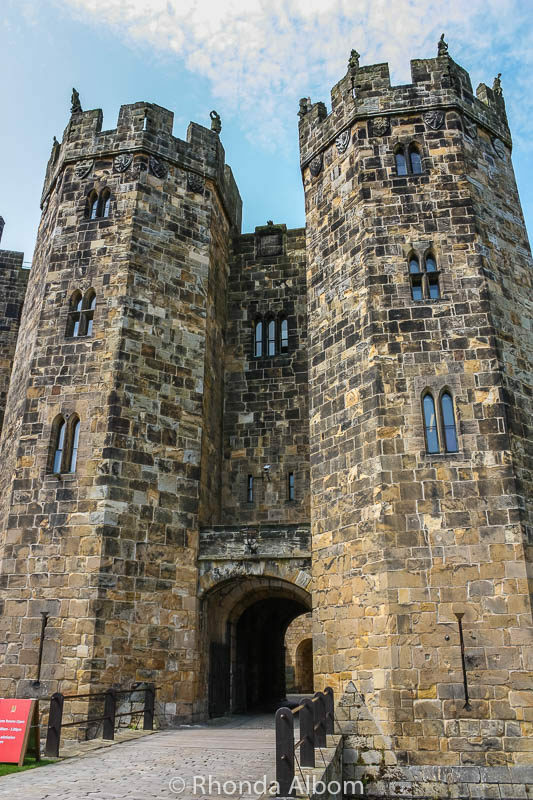 Have you been to Alnwick Castle? Would you visit as a fan of British history, or as a fan of Harry Potter or Downton Abbey? What an awesome castle! The gardens with those rounded borders looks so inviting. But how could you pass up broomstick flying?! Amazing! wow. it looks like a neat castle even without the Hollywood connections. i don’t recall it from Harry Potter specifically but it certainly has the right look and feel for those movies. my daughter would love it, especially the flying lessons. Only parts of it were used for Harry Potter, like the courtyard where the flying lessons were. This is exactly every Harry Potter fan’s dream! It must have been a surreal experience strolling on the castle’s grounds. It’s also quite amusing to know that it’s actually a place of residence. Thank you for sharing your experience Rhonda! Worth the read! My girls would sure agree with you. what a cool day trip, I am sure kids (and adults!) love it. i am not fan of Harry Potter (just saw a couple of films by chance) but I immediately recognized the site. overrun by tourists in a 150 rooms castle? cannot believe it . . .
LOL – I think their complaint was more about the coming and going, not the being there. Haha, interesting place to visit, especially if you go wit your kids! I wonder how is it like to live in one castle like that! I sure that the Duke and Duchess of Northumberland have a second residence! I can’t imagine living in 150 rooms. I sure wouldn’t want to have to clean the place. Of course, you have to pick broomstick flying over looking at a garden! My kids would make the same choice. I can’t imagine living in a place like this — with or without tourists milling around. I suppose they have to sell tickets to pay for some of the upkeep. I think all parents will agree with our choice. Pretty sure I’d be moving to the summer residence as well. Who would want all of those tourists trapsing through your house? I mean, it’s an incredibly castle and I’d love to see it too. They’re nice to share it with everyone. Love the broomstick photo. Agreed. I wonder if that is why the close the castle to tourists in the winter. I would love to visit ALL the locations of the Harry Potter movies, haha. That would probably take like a whole week or so but it would be so much fun! We hit quite a few of them. It is so beautiful, and filled with Harry Potter stories if you take the tour about it. It’s such a gorgeous castle – its no wonder it’s been featured in so many films. I’d love to try learning to fly a broomstick – and whilst I’m sure the guided tour was informative, I can imagine a bitter tour guide added a little extra something to made the day more memorable! Yes, it is so true. We barely remember most of our guides, but she will not be forgotten. I did it, so you can too. It’s that the way it always is. We don’t visit the locals spots unless we have visitors. I was surprised to see how many movies were filmed here. I can see where it would be pretty awful to have that many people on your property everyday, even if you had 150 rooms to yourself. Just the coming and going would be annoying. Both, for sure! I have a new interest in British history, but of course Harry Potter is cool, too. Also, I love the photography tips you included! Thanks for the linkup – we’re joining in for the first time! My girls thought so too. This such an amazing post. A big Harry Potter fan myself, would love to visit this place someday. The castle looks so majestic. In fact the gardens look even more beautiful than the castle. I am sure your kids must have had a great time. We didn’t have time to really explore the gardens, so we didn’t pay to get in. That garden shot is what you can see from the entrance. And yes, my girls loved it. You can certainly see why it’s been in a lot of films, what a castle! So true, It’s picture perfect. When my son was about 12 and my nephew about 13, my husband and I took them on a Harry Potter tour including Alnwick Castle as well as Lacock Abbey (where some classroom scenes were filmed), Oxford (the great hall and the stairway), a guided tour of Harry Potter film locations in London, a ride on the Hogwarts Express in the Scottish Highlands, and a few other stops I can’t remember right now. It’s a great combination for traveling with young teens: they spent their time trying to identify film locations, and we got to enjoy all sorts of historical buildings. At Alnwick they were “too old” for the broomstick lessons, but we spent quite some time watching a lesson! Yes, we did nearly all of these. We were in Scotland on the wrong day so we just visited the Hogwarts Express. Interesting that you kids thought they were too old for the broomstick flying. When we were there I was one of several adults in our group. Rhonda, We are a family of Harry Potter lovers, so we might need to go to Alnwick next we’re in England. Love it. There is so much Harry Potter sightseeing all over England. This was a highlight, but there are a few others in Oxford and of course London. Is this the same castle that they do the Downton Abbey tours at? I went to HP World, but didn’t visit any of the filming sets whilst I was living in England. It sure is. Downton Abbey used it after our visit. The castle was used in both the 2014 and 2015 Christmas shows. How fortuitous that I read this today! I just got my 11 year old the first Harry Potter book from the library today! Do a quick search on this blog for Harry Potter. My tween was a huge fan when we were in the UK. We visited lots of movie sights. Yes to most of the movies, no to seeing him live at the castle. LOL – I didn’t mention it in this post, so it’s optional if you want to spoil the magic. 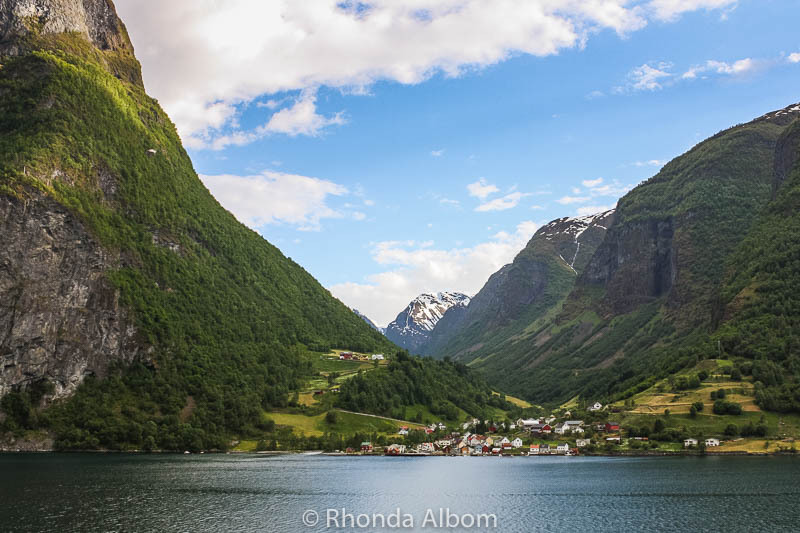 I totally enjoyed this blog Rhonda especially your little fun with a bit of Lightroom editing. Your daughters must have really enjoyed this visit. Have a great evening my friend. Thanks Paul, and yes this was a highlight for all of us. I took broomstick flying lessons too. Wow! 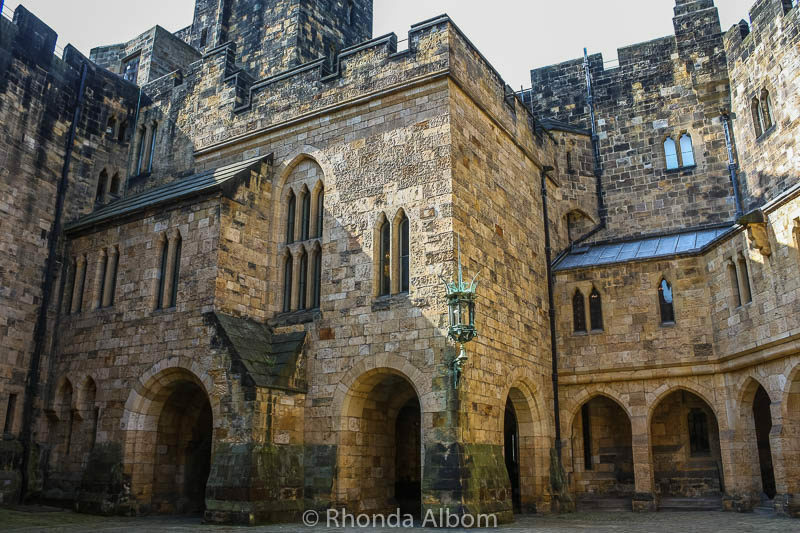 My grandson –a Harry Potter fan–would love to visit this castle! How well preserved it is! It’s the current home of the Duke and Duchess of Northumberland. I have heard the same about the gardens, maybe one day we will get back, but I doubt it with so many places to see in the world. I have always thought that David and I visited every castle in Britain when we were first married – including the ruined ones – but we must have missed Alnwick. Oh no! Now we’re going to have to go back. I like the Lightroom effects. This one is quite a bit off the beaten track, all the way on the east coast near the Scotland border. I love castles and I love them more if they are featured in the Harry Potter movie series 🙂 Great photos! I hope I can visit the castle soon! LOL – that seems to be a popular opinion. What a fantastic castle! We’d go visit even without the Potter connections, but that does make it just a little more fun. Definitely want to see the gardens, too, so thanks for the heads up that we’ll need to allow some time. Good stuff! There is plenty to see, so allow at least half a day if you want to see both. This is great! I’m such a fan of castles, Harry Potter and Downton Abbey and this would just make my trip. I haven’t heard of Alnwick before but it’s definitely going into my UK bucket list. Love this and it looks so beautiful. It’s a bit out of the way, on the east coast near the Scotish border. Thanks. I was pretty pleased with that photo also. The castle looks lovely and so much history. I hope to visit it someday. I don’t blame you tour guide for being upset about not getting in the movie. Thanks for sharing on #TheWeeklyPostcard. I don’t blame her for being upset either, but this was ten years later and she was still whining about it. It’s my kids who are huge Harry Potter fans. I can’t stay awake during the movies. Really. I wonder if they change what they do seasonally. I haven’t’ seen too many others write about the Broomstick flying. And, how cool to see Dumbledore. I’d love to go there if I were in the area. Like the fun shot on the broom. It’s well off the beaten path, so you would have to be going there on purpose. What a beautiful castle!I love every detail of it.And the broomstick flying is really interesting! I loved it too, and the broomstick flying was just fun. Only some of it was filmed here. The school hospital scene was filmed in Oxford (we went there too). Plus some was filmed in a studio. I’ve never gotten into the Harry Potter scene. However, I love castles, and this is a beauty. You did a great job with your Lightroom edits. I am not a huge Harry Potter fan, but my girls are. What a beautiful, mystical, and historic looking spot, no wonder they chose this for the location of the “Harry Potter” films. I agree, it’s a perfect castle. I think I could be interested in all three but British History would be my number one reason for visiting. Looks like a very interesting place. Love your photos! Dare I admit, we have never seen Downton Abbey. We homeschooled all the way through (one of our girls is in her last year of high school equivalent, the other is in her second year at Uni). I completely agree about reading and learning before you go. Living history is the best. Stunning pics! What a great read. Thank you for sharing. How cool is this! We just came back from visiting the Hogwarts at Universal Studios in Florida, but this is much, much cooler! Love the flying broomstick picture. I did not realize that the same castle had been used in both the Harry Potter films and the Robin Hood movie- now I want to watch them both back to back and compare! Thanks for sharing! I am surprised Universal Studios has Hogwarts. I would have thought Warner Bros kept it exclusively for themselves. That is so cool. Where did the trip you won take you? What a beautiful castle. Though my favourite part of it will always be that broomstick flying lesson. Ever since then I find myself floating off the ground every so often. They taught us “up” but not “down”. A little worried to be honest – I might get stuck like Neville Longbottom! So far you have been safe, so I am not too worried. It was only used in some of the scenes. There is also a Harry Potter studio tour outside of London. We could only go into very few of the 150 rooms. I hope we get back to the gardens one day too. Since I had spent so much of our day at Rievaulx Abbey, we just didn’t have time to see it all. Harry Potter won out. 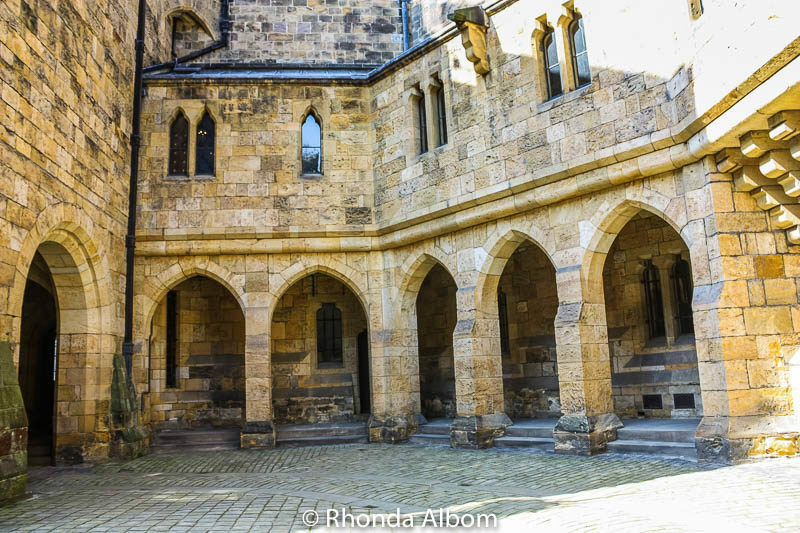 I love castles, so enjoyed this collection of pictures… I would have wandering around with my Harry Potter eye on though, spotting locations! Love the broomstick shot! I wonder if our guide showed us all the HP spots. Never got into Harry Potter, but I’d love to see the castle. That would be most fun. We took a Harry Potter focused tour, but there were others to choose from. The castle is lovely. I didn’t know it was used in Robin Hood. Fine looking castle. Bet the bitter guide was amusing. Thanks Ruth, and yes it is somewhere to visit. Beautiful shots. 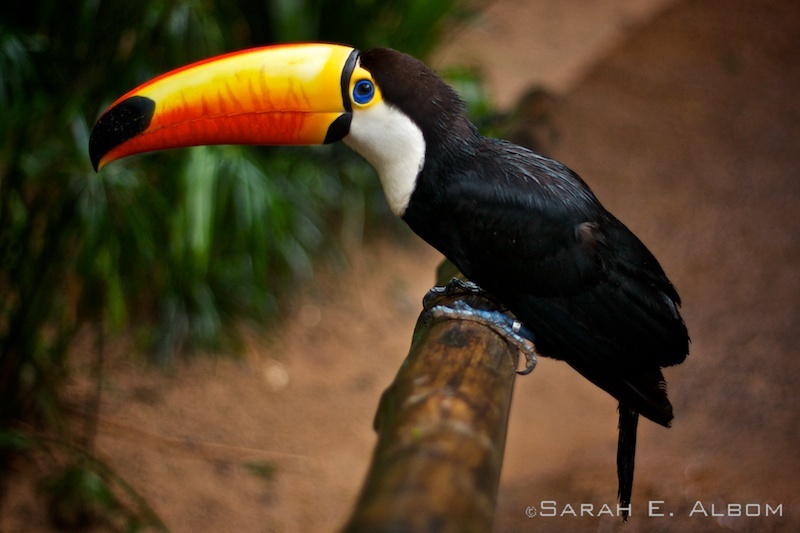 I’d rather roamed around the gardens than fly on a broom. That is the exact question we wondered. But she did give all sorts of interesting information about the filming problems. Like the time a big wind came up and all the fake snow got blown all over the castle grounds and massive cleanup effort that followed. Many of them are since we visited, so I hadn’t realised either until I did the research. It’s a perfect castle for a setting. I want to go to Hogwarts. Love Harry Potter. You are correct. One of my girls is a huge HP fan, so we did the HP tour and the Broomstick flying lessons, rather than spending lots of time in the interior.